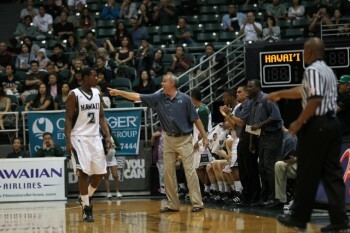 The Hawaii basketball team will apparently need a little more time to thaw out from its trip to Canada last weekend. The Warriors still looked cold in an 89-72 home loss to Eastern Washington on Tuesday night, November 22. A crowd of 5,521 at the Stan Sheriff Center watched the Warriors drop to 1-2 with their second consecutive loss. The first came just three days earlier against nationally-ranked Gonzaga in Vancouver, British Columbia, Canada. Eastern Washington improved to 2-2. The game was close in the first half, but Eastern Washington opened the second half with a 13-3 run and never looked back. 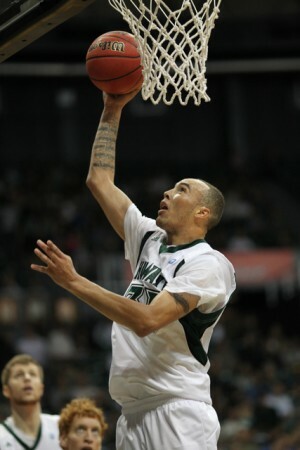 Five Hawaii players scored in double-figures, led by senior Zane Johnson’s 14 points. Vander Joaquim added 12 points and seven rebounds, and Wiseman contributed 12 points on 6-of-7 shooting. Shaquille Stokes and Joston Thomas scored 10 points each. But it was not nearly enough against an Eastern Washington team that shot 56.7 percent from the field in the second half, and converted 24 of 26 free throws (92.3 percent) for the game. Hawaii was actually in control for the first 15 minutes of the game. The Warriors raced to a 9-2 lead to open the game, and held a 27-21 lead with five minutes remaining in the first half. The Eagles closed the first half with a 12-2 surge to take a 33-29 advantage at halftime. They then opened the second half with the 13-3 run that increased the lead to 46-32 with 15:30 remaining. Hawaii never got closer than 11 the rest of the way. The Eagles out-rebounded the Warriors, 34-30, including 13-8 on offensive rebounds. The Warriors actually had a decent shooting night, going 24 of 49 from the field (49.0 percent). However, they went just 3 of 14 (21.4 percent) from 3-point range, and 21 of 34 (61.8 percent) from the free throw line. Joston Thomas provided a bit of a spark off the bench in the second half. He scored all 10 of his points in 11 minutes of action in the second half, when he shot 4 of 6 from the field and 2 of 3 on free throws before fouling out in the closing seconds. 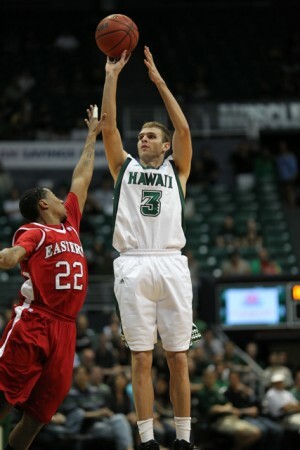 Collin Chiverton, who was being recruited by Hawaii while he was at junior college in San Francisco last season, finished with 20 points to lead the Eagles. The Warriors will play another home game this week when they host Pacific on Friday. Not a fan of the effort tonight, They need to come out next game and prove this was a fluke. This Eastern Washington team is fast! They made Hawaii look like they were napping tonite. The turnovers and steals was just too much. Come on guys, let’s do a better showing this Friday. PROTECT YOUR HOUSE! Thing is it wasnt the legs, UH just got out hustled and needs to step up their defense. Is Miah coming back? Could have used his ball-handling and spark tonight.. Lost year for football already.. No way we’re beating BYU. Come back, Miah! All I can say is Gerry , Gerry , Gerry, …… Gerry Blakes ! We need you ,real SOOON!!!!!!! How is Hauns not starting?! He’s a scorer! Avg 30 pts a game last year. He could of easily gone somewhere else but gave that up to come here, and they don’t even give him PT. Against gonzaga he went in for three min, made a three, then for no reason got taken out….! What’s up with that?! This is ridiculous! You said it, he’s a scorer…he’s just not a good defender yet. Gib’s a defense minded coach, and if you don’t play good defense you’ll see limited PT. He has active hands and seems to trap and help well, but in man to man D, which is what they’ll play mostly this year, his on-ball defense needs work. 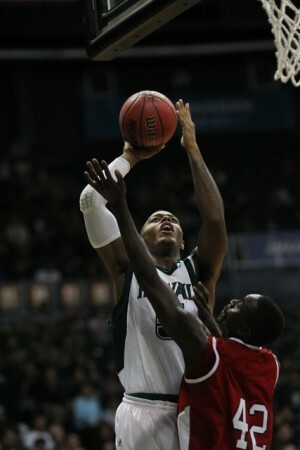 That was evident against EWU, a very athletic team, where their wings drove by him several times. As the coaches work with him, I’m sure he’ll improve on the defensive end but you guys need to quit comparing his JUCO stats. He’s not going to score 30 ppg here, it’s a completely different competion level than a CC. HAPPY THANKSGIVING! We should be grateful for this learning experience – yeah, we may have had jet lag, yeah Hauns scored 30 ppg @ JUCO, yeah we did not make half-time adjustments, bottom line is that we did not play good “supportive” defense . . . The help and cutting-off lanes was not there! We did not take enough charges nor did we rebound well off missed shots – long (3 pt.) shots = long rebound . . . we just did not go after it hard enough (hustle). We need to reduce turnovers, quickly. Some players may have been intimidated by their athleticism; oh well, let’s learn and move on!